This is my digital life, circa mid-2013. Your mileage may vary, but I bet only in degree. On June 3th, I sent 111 emails and received 474, according to Mailstrom, an email management tool that I recently started using. On June 4th, I sent 126 and received 476. On June 5th, I sent 103 and received 419. You think this is just what my Gmail account looked like on the days right before Personal Democracy Forum? On June 13th, a week after the conference, it was 43 out and 397 in. According to Google, I have received 8,952 emails from more than 1700 contacts in the last thirty days, and I sent 1,671 to more than 500 different people. No wonder my brain hurts. But this is just the beginning of understanding digital life today. A lot of these emails are from people I work with. Those definitely get my attention. A handful are from family and friends. I don’t want to ignore those either. Some are from list-servs that I subscribe to. Arguably those can be ignored, but good list-servs are valuable tracking tools. They keep me informed and engaged. If I had to guess, simply keeping up with my email now eats three to four hours of my waking life, every week day. And not all emails are created equal. Some can be consumed and responded to in seconds. Others actually contain, compressed within their electronic confines, hours of work by the sender, demanding equivalent time and attention in response. They come “overwinded,” to use one of several new terms coined by Douglas Rushkoff in his terrific new book Present Shock for describing the pathologies of our digital lives. I read Present Shock two months ago, and found myself underlining and taking notes on nearly every page. Somehow, he ties together dozens of seemingly disparate phenomena–the popularity of reality TV, the death of ideology, how news has been replaced by spectacle, our compulsion to constantly “check in” on our digital inputs, the rise of the Tea Party and Occupy movements, even our culture’s fascination with zombies and impending apocalypse–and finds the signal in all the noise. It’s worth a listen. Temporal compression isn’t new. Humans have been binding time for ages, Rushkoff notes, citing the work of Alfred Korzybski. Civilization and culture are the knowledge and experiences of many generations compressed into digestible and learnable packages. But now, with so much knowledge available, so many opportunities for self-expression, so many experiences being shared, and so many demands on our attention, our experience of time itself, Rushkoff argues, is being radically transformed. The future is here and it’s breaking the present. Oh yes. Take my Twitter feed. If I leave a tab open just to watch tweets flow in as I write these words, at 9:30 on a week night, in 5 minutes I’ve got 66 new ones to read. At that rate, I’ll have nearly 20,000 new tweets to read by tomorrow night. Obviously I’m not going to read them all–I’ve long ago learned to watch Twitter for the overall flow, and rarely try to stay engaged with everything that passes by. Tools like TweetedTimes.com, which aggregate the top links that the people I follow are tweeting about, give me 20-30 top headlines to peruse. But that takes time too. I remember when Twitter was a cure for boredom; now sometimes boredom seems like a cure for Twitter. What else? As I write this, I’ve got 27 tabs open on my browser. One is to a Google doc that I’m not done editing–compressed work waiting to be unsprung. Two tabs are to long New Yorker articles that I want to remember to read; more compressed work waiting its moment of attention. Between new emails, new tweets and open tabs, every day my laptop can hypothetically generate enough attention demands to eat a whole day. Not only do I have many open tabs, I’ve got at least six books that I’m in the middle of finishing: I’m nearly done with Ethan Zuckerman’s Digital Cosmopolitans, one of several terrific new books about the Internet that I am always reading for work reasons; partway thru Tom Segev’s The Seventh Million: The Israelis and the Holocaust, which I started after visiting Auschwitz last February; nearly done with Doris Kearns Goodwin’s Team of Rivals, which I got into after seeing Lincoln, the film; rapidly devouring W. Bruce Cameron’s A Dog’s Purpose (it’s a warm bath for the brain); and slowly making my way thru Sinclair Lewis’s The Jungle. which I downloaded for free onto my iPhone exclusively for when I’m on the subway and can’t get to my email or Twitter! Speaking of my iPhone, I’ve got 11 screenfuls of apps that I’ve downloaded and the open ones at the moment include WeatherBug, RunKeeper, Maps, SleepCycle, and Vine. I’m in four current games of Words with Friends. And that’s not all. I’ve got a personal blog that I haven’t updated since February; a blog for my Good Question Project sideline that I haven’t updated in over a month; and a Facebook account that I rarely look at, but where more than 50 people are waiting to see if I will friend them. Same on LinkedIn. Some days, I just work in interruption mode. Whatever interrupts my attention gets my attention. While I love my work, being digital doesn’t feel like that much of a gift any more. I am overwound and digiphrenic. And I don’t think I’m that unusual. 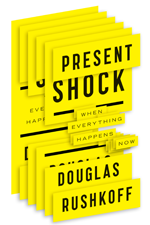 Present Shock is not just an eerily accurate diagnosis of how many of us live today. It is also a brilliant and urgent dissection of how the digital age is driving our culture and politics to distraction, and what we can do about it. The bad news? We’ve stopped living in linear time; that is, nothing moves forward any more. Instead, our Gross National Attention flits from spectacle to spectacle. Remember not long ago, when the country was focused on gun control after Sandy Hook? Or climate change after Hurricane Sandy? Or immigration reform? I’m sorry, that’s on for this week, at least until it gets bumped aside by some natural disaster, celebrity tragedy or act of terror. I used to think that our crisis-driven news cycles offered an opportunity to would-be do-gooders. “You need to be ready for the next big disaster, because you will be deluged by volunteers calling you and emailing you offering help; are you ready to channel all that distributed power?” I’d ask my activist friends. But while huge disasters keep coming (BP, Sandy) and some volunteers are showing up, the bigger trend isn’t “do it ourselves,” it’s “watch it ourselves.” The politics of spectacle wants to keep us transfixed, in spectator mode. And our digital tools and presences that they generate are using us and shaping us, more than we are using them to reshape the world. And this isn’t just a crisis of how we mediate our lives. It is also about the growing realization that many of us have negative futures; that our children’s lives will not be better than our own, which was the great promise of the “American Dream” and every other country that has embraced the “free market.” Twenty-somethings graduating college with more debt than their service-economy jobs can help them pay off are one vanguard of this depressing reality. How are we responding to all these symptoms? Individually, for people who recognize present shock in their own lives, the move is toward disconnecting, at least temporarily. You can see this happening among some of the earliest and most voracious adopters of all things D. For example, a year ago, Rachel Sklar, the hyperkinetic connector who calls her Blackberry her “life partner,” signed on with the Sabbath Manifesto “Unplug Challenge” and went off the net for 24 hours. Padmasree Warrior, the CTO of Cisco, says she takes a day off the Internet every week. 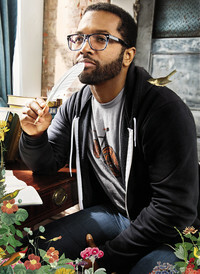 Activist comedian Baratunde Thurston, the 2011 Foursquare Mayor of the Year, sensed himself burning out last fall after a grueling book tour and political season and decided to go offline for 25 days. “I just wanted to be mentally free of obligations, most of which asserted themselves in some digital fashion,” he writes in a just-out Fast Company cover story about his experience. Interestingly, the hardest thing about Thurston’s digital detox was figuring out how to shut off most of his social media services; unlike email, they don’t offer a vacation mode. And as someone who admits he has given hundreds of apps, websites and services the rights to publish his activities to his Facebook and Twitter pages, he found that he couldn’t even use Netflix on his laptop without inadvertently posting an update and violating his promise to disconnect. Such solutions may work for individuals, but only barely, since we are all in this together. Or, as the vendors of all this tech actually put it, we are locked in. The digital economy is not kind to those on the slower side of the digital divide. Most individuals can’t drop out; we need a collective response. But while some new mass protest movements have emerged in response to present shock, they leave much to be desired. First, there are the “Apocalyptos”–people who believe that we are on the verge of a societal breakdown or transformation. Our culture has a hunger for this kind of resolution, if the ratings for shows like ABC’s Revolution or AMC’s The Walking Dead are any indication. (Watch the box office returns for Brad Pitt’s World War Z this weekend.) “At least the annihilation of the human race,” Rushkoff writes, “resolves the precarious uncertainty of present shock.” It “finally ends the ever-present barrage of media, tax forms, toxic spills and mortgage payments, opening the way to a simpler life of farming, maintaining shelter, and maybe defending one’s family.” From Zombies, perhaps. Believers in the Singularity are indulging in the same fantasy of a release from our present muddle, Rushkoff notes. Second, there is the Tea Party phenomenon, which Rushkoff argues is “the first true political movement to emerge out of present shock.” I’m not so sure I buy that argument; careful ethnographic study of the Tea Partiers suggest that they are mainly a continuation of hard-right conservative politics, juiced by the election of an African-American Democratic President. But Rushkoff’s beef with Tea Partiers isn’t that they’re too rightwing. It’s that they’re too impatient to deal with the complexities of today, seeking instead to impose harsh and simple solutions rather than wrestle with the challenge of governing in the real world. And that certainly is a classic response to too much change and overstimulation. Years ago, sociologist Myron Orfield told me that whenever the rate of population growth exceeded ten percent per year in a given locality, towns and counties started voting down local budgets. Shouting “no, stop the future” is hardly a viable response to present shock. None of these movements are tenable. Apocalypse is out of the question. Shrinking government and cutting taxes isn’t going to make present shock go away–and besides, if the Tea Party had its way most of its members (and the rest of us) might have a few more bucks in our pockets, but vastly increased costs of self-protection. And Occupy didn’t last, not as occupations, anyway. If the police hadn’t cracked down, the endless general assembly meetings would have eventually lost their momentum because they didn’t scale as decision-making platforms for the movement. Well, I can buy that idea. Having finished this book review, I’m going to go for a long bike ride. My FitBit says I’ve only taken 1,255 steps so far today. And my SleepCycle app tells me that whenever I work out, I get a better night’s sleep. But I already knew that, didn’t I?